This frittata recipe comes from my all-time favorite blogger-turned-cookbook-writer, Deb Perelman. She posts her delectable recipes over at SmittenKitchen.com. I made this frittata the morning after I stayed up really late to finish my last final assignment for the semester (I even turned that sucker in two days early!) and it really hit the spot! I followed Deb’s recipe pretty closely, but instead of using a cast-iron skillet (it’s on my list of things to buy), I used a basic 9-inch baking dish. 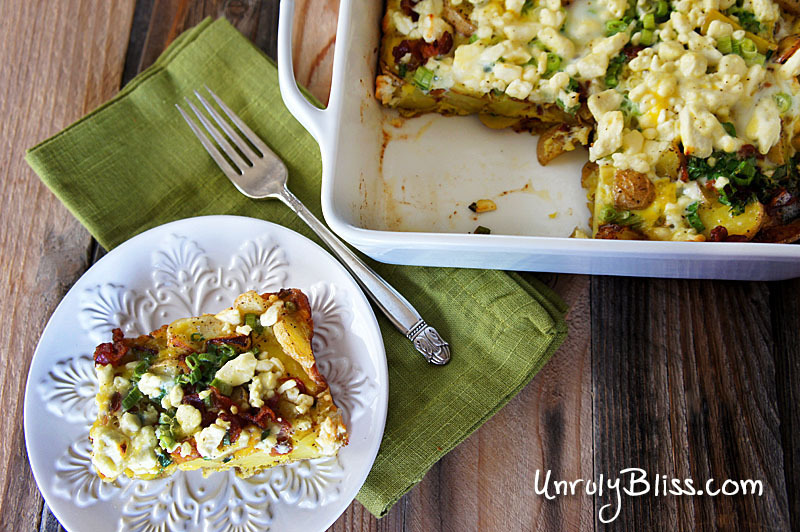 There are tons and tons of ingredients you can toss into a frittata, but all of these ones tasted divine together. The salt from the bacon and the feta cheese…oh my. 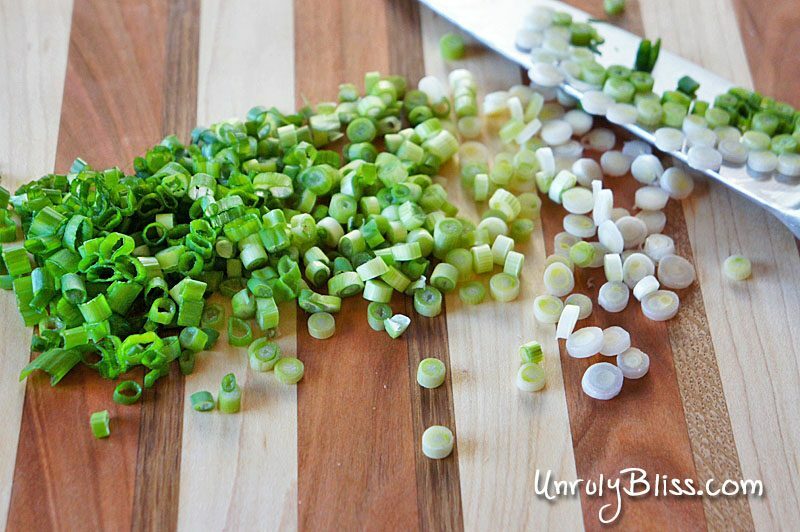 Oh and for anyone wondering what scallions are…think green onions. Recipe (slightly adapted) from the amazing Deb Perelman in her "Smitten Kitchen Cookbook"
Coat a roasting pan or baking tray with a generous amount of oil. Season the potatoes with salt and pepper, pile them in the prepared pan, and roast them for 30 minutes. *While the potatoes are roasting, cook the bacon in a well-seasoned, 9-inch cast-iron skillet until it’s crisp. Remove the bacon with a slotted spoon or tongs (leaving the bacon drippings in the pan) and drain it on a few paper towels. Add an additional tablespoon of oil to the bacon drippings and reheat the skillet over medium heat. Fully coat the skillet by swirling the oil and drippings around the skilelt and up the sides. Once the potatoes have finished roasting (it’s okay if they’re not fully done after 30 minutes because they’ll keep cooking with the eggs), pour them into the oiled skillet. 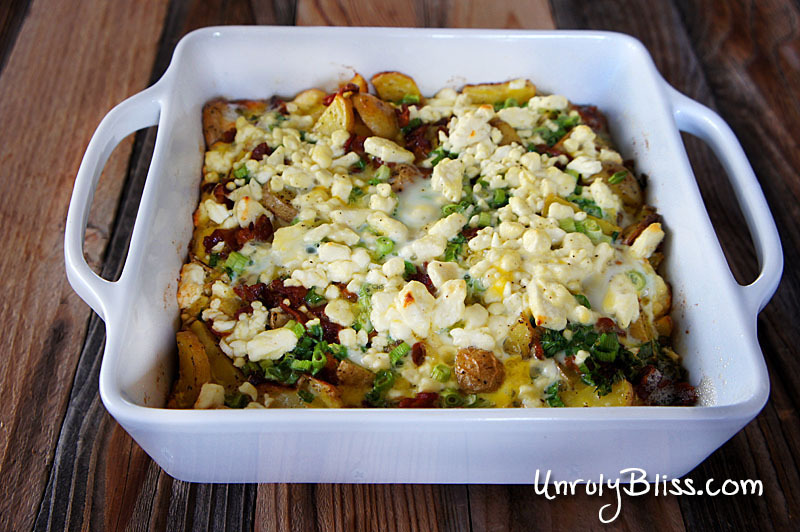 Scatter the bacon, scallions, and feta over the potatoes. Whisk the eggs with the milk, 1/2 teaspoon of salt, and 1/4 teaspoon of black pepper in a medium bowl, then pour it all over the potato mixture. Cover the skillet with foil and bake it for 20 minutes. Remove the foil and bake it for an additional 10 to 15 minutes or until it’s puffed at the edges and firm in the center (you can check the center with a toothpick). Serve right from the skillet!